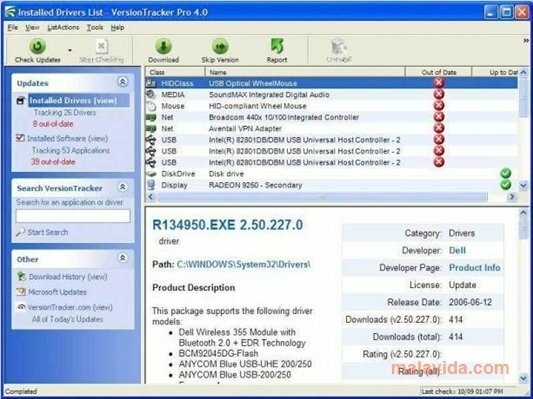 VersionTracker Pro is a tool that will let you know each time one of your programs or drivers update, so as to download the latest version and thus not having to search for the official website each time you believe that something has changed. The program doesn't only monitor the versions that you have installed, but it also allows you to search for new programs, preview the changes of each new edition, manage the downloads of the new versions that you want and uninstall programs that you no longer need. One of the most striking features is the possibility to be able to avoid an update, because the program will automatically configure itself to let you know when the next one appears, something very important when errors are detected in an update. The interface is very similar to that of any download manager and thanks to the distribution of the elements it is very easy to know what applications or drivers are outdated and which aren't. The important controls are visible and it isn't necessary to browse through the menus to update any element. Download VersionTracker Pro and discover how easy it is to keep the programs and the controllers of your PC up to date. It's necessary to pay a monthly fee to be able to use the application.